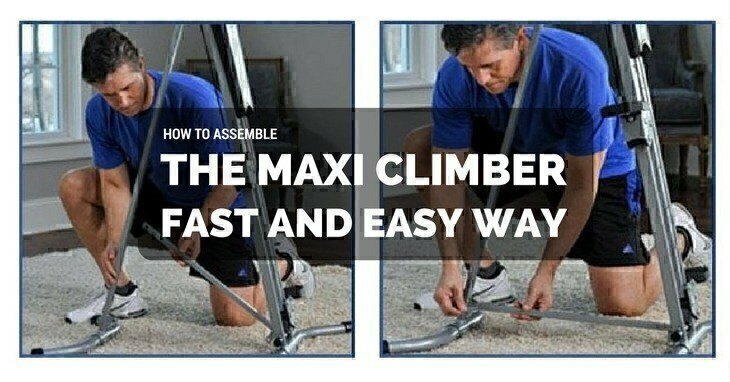 If you want to know how to assemble your Maxi Climber with ease, then this post is perfect for you. Some people are good at DIY projects but others, not so much. I can relate with those in the latter category which is why I prefer pre-assembled items – from strollers and rockers to treadmills. But there are those who are good with basic tools. And if you’re one of them who happened to purchase a Maxi Climber, then this article is for you. If you know how to assemble Maxi Climber, then you don’t need to add small budget when buying in Amazon for the ‘Expert Assembly’ option. To be fair, there’s not much to do. Still, however, it requires patience – a bucket load of it. The good thing about this exercise machine is that everything you will need is already there in your package. They earned huge points for that because I never enjoyed taking out my husband’s tool box for assembling stuff like this. And before you start asking about additional bolts and screws, there’s no need for any of those. Besides, this comes with an instruction booklet, but if that’s a bit confusing for you, I got you covered. Gather all the necessary items. The purpose is to save time. Lucky for you, it’s all inside the box, and once it arrives on your doorstep, you can take out the parts and examine if they’re all complete. Make room and make sure no child is anywhere near you. What I like to do is separate the area into two parts: on my right side are the materials and on my left is the space for the assembly. This way, I can take one part and add it to the machine without the need to scramble through the stuff and possibly lose screws or bolts in the process. Start working on the base. You can do this by standing the machine with the words ‘Maxi Climber’ upside down. Remove the two nuts and bolts at the top. Put this somewhere where you’re sure you cannot accidentally misplace them. Pick up the larger U-bar and fit inside the cradle. Line up the holes and then screw back the bolts, so they run through both the U-bar and cradle. Use the wrench to tighten it and secure the parts. You will notice an ‘arm’ that you can put down or raise back up. It has the same nuts and bolts with the base. You will remove those and set aside – making sure it’s a place that’s easy to reach. Use the smaller U-bar for this one and fit into the cradle. After aligning the holes, run the nuts and bolts through them and tighten. You can locate the ‘safety pin’ at the base. Carefully remove this, so the bar will drop down and rest into a triangle protrusion on the opposite side of the base. The holes in the bar and triangle should align with each other, and this is where you will insert the safety pin. It is a crucial step because the pin will help stabilise and hold it together especially during an intense and rigorous workout. At the front of the Maxi Climber near the base, remove the top middle bolt on the left and right side. Attach the pulleys by securing the circular attachment around the bolt. Put the nut back and tighten. It is what helps the pedals go up and down smoothly. Insert the larger handlebars into the slots by pressing the metal pin and sliding them – you know it’s correct when they are positioned parallel to the floor. You should place the smaller hand grips at the cylinder located at the back. You know it’s secured when it locks into place. See? It’s not that hard, is it? You probably won’t need anyone’s help in assembling this machine just as long as you carefully follow the instructions. It’s pretty straightforward and foolproof if you ask me. Just make sure there are no distractions while you do it – kids running around or dogs picking up the parts. Remember that your end goal is to assemble the Maxi Climber to ensure your safety while you exercise. Although there’s an option to have a professional assemble this machine, you might find the cost a bit too much. Even if you’re not into DIYs and you don’t have much inside your toolbox at home, you can still do this. As you can see, everything you need is inside the package. It will probably take no more than 30 minutes to finish putting it together assuming you have everything ready and didn’t misplace any of the bolts and nuts you removed. But seriously though, you won’t break a sweat with this one. Have you tried assembling your Maxi Climber? How was it?